Warning: this post is mostly technical, since nearly nothing changed feature-wise. Testing is really needed though, internal changes are quite heavy! Some data was removed from the detailed view (modes and owner – UNIX-only, and Blender is not an OS file browser!). Columns of compact (default) and detailed views are now fixed-size (among four choices, like for previews view). This is due to internal changes detailed below. Smaller memory footprint when browsing directories with huge number of items (several thousands and more) – especially in case of preview display mode. Much quicker display of those previews. Plan is to merge this branch (or as much as possible of it) into master after 2.75 release. Now for the technical details! The main changes are under the hood – a full rewrite of our file listing code, to reduce memory usage and global computing effort. The idea is to keep as few as possible data from actual directory(-ies) listing, and to generate the full stuff needed to draw in filebrowser window only when needed, following the “sliding window” principle. So, let’s say your file browser is currently centered on item 4000 in a directory containing 10000 files. We do store minimal data for those 10000 files (what’s needed for sorting and filtering), but only generate complete info (detailed types, strings for size, previews, etc.) for items through 3489 to 4512. Then, if user scrolls slightly to center item 4500, we only trash items up to 3988, and only have to generate those from 4513 to 5012… As a bonus, this means e.g. previews are generated for visible areas first, instead of ‘flat’ top-to-bottom process which would sometimes takes several tens of seconds to reach the bottom of the listing. This allowed us to reduce our `direntry` struct size (it now basically wraps path and stat info). But the main improvement is with previews – since a few days previews are now 256*256 pictures in master. For a directory with 10000 images in preview mode, that means 2.6GiB of ram – just for previews! While with a sliding window of about one thousand items, we can limit this to a maximum of 266MiB – should we be browsing a directory with tens of thousands of items. This is a rather extreme example of course, but not uncommon (think e.g. to render directories, or one with one or two hundreds of library .blend files read in new ‘flat’ mode…). And there is another reason why this change is needed: future asset engines. One can easily imagine on-line asset repositories with tens of thousands of items, you just cannot generate in Blender items for all of them at once! With that new code, asset engine only gives Blender the total number of entries, and then Blender requests for a limited range of those as needed (note that ordering and filtering will obviously also be deferred to asset engines). Consistency: .blend library items previews are now handled as any other (image, font, .blend file itself…) – this also means other areas of the code can easily get previews for them. Performances: since they are handled by IMB_thumb, they also use the thumbnail caching system – in other words, .blend file is read once, regenerating the thumbnail later will only be a matter of reading the cached .png file! Also, one side effect of those heavy changes is that previews should be generated much more quickly, since they now use a much lighter `BLI_task`-based threading, instead of the complex and heavy `Job`-based one. So, as some of you may know already, since December 2014 and my three weeks spent in Amsterdam at BI, I’ve started working on the asset topic. 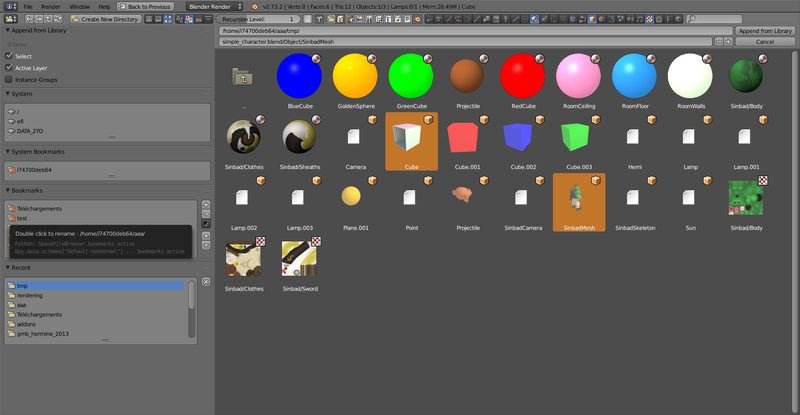 An ‘Append’ file browser with two blender files showing all their materials, objects and textures. Note the renamed bookmark on the left too. Bookmarks and co using UIlists, with possibility to rename and reorganize bookmarks, plus the default features of UILists (filtering by name, and some sorting). Possibility to list the whole content of a blend file (in append/link mode) at once (set ‘Recursion Level’ setting to 1), and in any mode, to list several levels of the directory tree in a “flat” mode (including blend files content if relevant, set ‘Recursion Level’ to 2 or more). Consequently, possibility to append/link at once several items, either from a same .blend lib, or even from different ones. Also, filtering by datablock types was added (so that you can see only e.g. materials and textures from all .blend libs from a same directory…). Previews were added to object and group datablocks. Generation of those is handled by a python script (note: only handles BI renderer in this build, Cycles is yet to be added). Directory listing is now also a background job (like thumbnail generation of images and .blend files), which means listing huge directories, or remote ones, does not lock the UI anymore. Previews of datablocks (IDs) are now exposed in RNA, so third party scripts will also be able to generate their own previews if needed. Not all ID types have previews though (only object, group, material, lamp, world, texture and image ones currently), this is likely to change though. So, as usual, any feedback is more than welcome! Note too that Windows behavior was not tested at all yet (don’t like starting my win WM ), do not expect (too much) issues on this platform, but you never know with Windows. Cheers, and hope that new year will be full of good things for Blender and all of you! 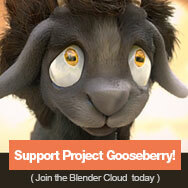 Blender is NOT an API – let alone its addons! By breaking the existing script interface and changing the way curves work you have done a tremendous disservice to the people that need FBX export the most. The fact that you got the funds to do this development in part from Unity Tech, but couldn’t be bothered to keep the old interface intact tells me you are not competent for this kind of work. You don’t understand the priorities, at all. You could’ve had named the new export “save_bin” or “save_new”, or something like that, instead of keeping the name but breaking the interface nonetheless. Instead, you expect Unity (and everyone else) to clean up after you. The idea that you couldn’t just easily support this is nonsense. Secondly, you don’t understand that people absolutely *need* the classic FCurve workflow. The new “baking” workflow is a nice feature, but only if it is optional. It can’t just replace the old workflow, and you shouldn’t be wasting everyone’s time by just changing this without being explicit about it. I sincerely hope you can be bothered to keep the old ASCII export around, as long as you have these regressions in the binary exporter. So, to that specific case first. I did not remove nor renamed io_scene_fbx.export_fbx.save, as everyone can see in that history page. So people could first stop talking about things they do not know about. Actually, I added new “bin” exporter in a new py file, with a new name. Nevertheless, it somehow broke that Unity’s script… What the heck? Seriously! That does not make me happy. Not at all. I’ve spent let’s say about three months of full-time work (probably more, actually) on the mess that’s called FBX. I would not wish that to my worst enemy. I’m already really sick of it, I’m pushing myself to complete the last pieces of needed features in new exporter (and importer) for 2.72… All those guys might gain is me dropping completely and definitively this task. They are free to take it over, since they are so wise ans full of knowledge and competent and super heroes and all that, I’d wish them good luck. Now, back to the general case. Again, Blender is not a library. Let alone its addons!!! We do have a few pieces of library inside Blender – some helper modules in python, PY RNA interface itself (how properties are defined, how operators are called, that kind of stuff). But! Operators themselves, data access themselves, RNA types themselves are not an API, in the sense they offer a direct acces to Blender’s internals, and Blender’s internals are not, were never meant to be, and will (probably) never be a library. Which means we do not have to twist and tweak to keep compatibility. We do try to do it, to some reasonable level, of course. We rarely do mere renames, and when we do, we keep old names (as deprecated) available at least for one or two releases. When we add a new parameter to a function, we try to make it optional as much as possible. But when we change how an operator works, or remove one, because it’s no more needed inside Blender or was doing bad work, we won’t keep it as a stupid “proxy” just for our py interface. Nor do we when we change data structures inside Blender. As a side note, let me say you how much a mess can come from trying to keep compatibility – I had to experience it while working on (yes, again!) FBX format, and this does not give a nice result. At all. So, as a final word: we do not need people which are just yelling, without actually doing anything, not even being constructive, which do not simply know how to talk with others! To those: STOP WAISTING OUR TIME!